HydroPouch! 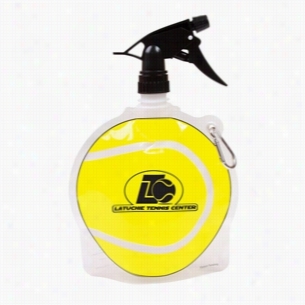 24 oz Tennis Ball Collapsible Spray Top Water Bottle - Patented. Exclusive, patented 24 oz reusable BPA-Free Tennis Ball-shaped water bottle with polypropylene plastic Spray top.Bottles are made of light-weight easy-to-fold, bendable plastic that means bottle can be collapsed flat and easily stored away when empty and stands like any other bottle when full.Bottles are made of durable Nylon with PE laminate bottle is freezer friendly.Designed for use with cool liquids only.Not microwave of dishwasher safe. Hand wash only.Spray tops enable bottle use to help keep you cool, water your plants and many other applications.Bottles are lightweight and ship flat - great on your Wallet and the environment/carbon footprint.Features unique Tennis Ball stock-art on front, clear panel back.Each bottle comes with reinforced grommet with carabiner for easy carry on the go.Carabiner is designed for use with empty bottle only. Use of carabiner with full bottle may result in tearing and other damage. CHOKING HAZARD-small parts. Not intended for children under the age of 3. For QCA request, products will come with the PO number. HydroPouch! 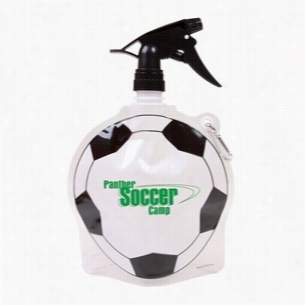 24 oz Soccer Ball Collapsible Spray Top Water Bottle - Patented. Exclusive, patented 24 oz reusable BPA-Free soccer ball-shaped water bottle with polypropylene plastic spray top.Bottles are made of light-weight easy-to-fold, bendable plastic that means bottle can be collapsed flat and easily stored away when empty and stands like any other bottle when full.Bottles are made of durable Nylon with PE laminate bottle is freezer friendly.Designed for use with cool liquids only.Not Microwave of dishwasher safe. Hand wash only.Spray tops enable bottle use to help keep you cool, water your plants and many other applications.Bottles are lightweight and ship flat - great on your wallet and the environment/carbon footprint.Features unique soccer ball stock-art on front, clear panel back.Each bottle comes with reinforced grommet with carabiner for easy carry on the go.Carabiner is designed for use with empty bottle only. Use of carabiner with full bottle may result in tearing and other damage. CHOKING HAZARD-small parts. Not intended for children under the age of 3. For QCA request, Products will come with the PO number. HydroPouch! 24 oz Hockey Puck Collapsible Spray Top Water Bottle - Patented. Exclusive, patented 24 oz reusable BPA-Free hockey puck-shaped water bottle with polypropylene plastic Spray top.Bottles are made of light-weight easy-to-fold, bendable plastic that means bottle can be collapsed flat and easily stored away when empty and stands like any other bottle when full.Bottles are made of durable Nylon with PE laminate bottle is freezer friendly.Designed for use with cool liquids only.Not Microwave of dishwasher safe. Hand wash only.Spray tops enable bottle use to help keep you cool, water your plants and many other applications.Bottles are lightweight and ship flat - great on your wallet and the environment/carbon footprint.Features unique hockey puck stock-art on front, clear panel back.Each bottle comes with reinforced grommet with carabiner for easy carry on the go.Carabiner is designed for use with empty bottle only. Use of carabiner with full bottle may result in tearing and other damage. CHOKING HAZARD-small parts. Not intended for children under the age of 3. For QCA request, products will come with the PO number. HydroPouch! 24 oz Volleyball Collapsible Spray Top Water Bottle - Patented. Exclusive, patented 24 oz reusable BPA-Free Volleyball-shaped water bottle with polypropylene plastic spray top.Bottles are made of light-weight easy-to-fold, bendable plastic that means bottle can be collapsed flat and easily stored away when empty and stands like any other bottle when full.Bottles are made of durable Nylon with PE laminate bottle is freezer friendly.Designed for use with cool liquids only.Not microwave of dishwasher safe. 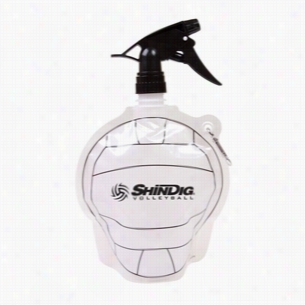 Hand wash only.Spray tops enable bottle use to help keep you cool, water your plants and many other applications.Bottles are lightweight and ship flat - great on your Wallet and the environment/carbon footprint.Features unique Volleyball stock-art on front, clear panel back.Each bottle comes with reinforced grommet with carabiner for easy carry on the go.Carabiner is designed for use with empty bottle only. Use of carabiner with full bottle may result in tearing and other damage. CHOKING HAZARD-small parts. Not intended for children under the age of 3. For QCA request, Products will come with the PO number. HydroPouch! 24 oz Basketball Collapsible Spray Top Water Bottle - Patented. Exclusive, patented 24 oz reusable BPA-Free basketball-shaped water bottle with polypropylene plastic spray top.Bottles are made of light-weight easy-to-fold, bendable plastic that means bottle can be collapsed flat and easily stored away when empty and stands like any other bottle when full.Bottles are made of durable Nylon with PE laminate bottle is freezer friendly.Designed for use with cool liquids only.Not Microwave of dishwasher safe. Hand wash only.Spray tops enable bottle use to help keep you cool, water your plants and many other applications.Bottles are lightweight and ship flat - great on your wallet and the environment/carbon footprint.Features unique basketball stock-art on front, clear panel back.Each bottle comes with reinforced grommet with carabiner for easy carry on the go.Carabiner is designed for use with empty bottle only. Use of carabiner with full bottle may result in tearing and other damage. CHOKING HAZARD-small parts. Not intended for children under the age of 3. For QCA request, products will come with the PO number. HydroPouch! 22 oz Football Collapsible Water Bottle with Spray Top - Patented. Exclusive, patented 22 oz reusable BPA-Free Football-shaped water bottle with polypropylene plastic Spray top.Bottles are made of light-weight easy-to-fold, bendable plastic that means bottle can be collapsed flat and easily stored away when empty and stands like any other bottle when full.Bottles are made of durable Nylon with PE laminate bottle is freezer friendly.Designed for use with cool liquids only.Not microwave of dishwasher safe. Hand wash only.Spray tops enable bottle use to help keep you cool, water your plants and many other applications.Bottles are lightweight and ship flat - great on your Wallet and the environment/carbon footprint.Features unique Football stock-art on front, clear panel back.Each bottle comes with reinforced grommet with carabiner for easy carry on the go.Carabiner is designed for use with empty bottle only. Use of carabiner with full bottle may result in tearing and other damage. CHOKING HAZARD-small parts. Not intended for children under the age of 3. For QCA request, products will come with the PO number. HydroPouch! 24 oz Baseball Collapsible Spray Top Water Bottle - Patented. Exclusive, patented 24 oz reusable BPA-Free baseball-shaped water bottle with polypropylene plastic spray top.Bottles are made of light-weight easy-to-fold, bendable plastic that means bottle can be collapsed flat and easily stored away when empty and stands like any other bottle when full.Bottles are made of durable Nylon with PE laminate bottle is Freezer friendly.Designed for use with cool liquids only.Not microwave of dishwasher safe. Hand wash only.Spray tops enable bottle use to help keep you cool, water your plants and many other applications.Bottles are lightweight and ship flat - great on your Wallet and the environment/carbon footprint.Features unique baseball stock-art on front, clear panel back.Each bottle comes with reinforced grommet with carabiner for easy carry on the go.Carabiner is designed for use with empty bottle only. Use of carabiner with full bottle may result in tearing and other damage. CHOKING HAZARD-small parts. Not intended for children under the age of 3. For QCA request, products will come with the PO number. HydroPouch! 24 oz Global Collapsible Spray Top Water Bottle - Patented. Exclusive, patented 24 oz reusable BPA-Free Global-shaped water bottle with polypropylene plastic spray top.Bottles are made of light-weight easy-to-fold, bendable plastic that means bottle can be collapsed flat and easily stored away when empty and stands like any other bottle when full.Bottles are made of durable Nylon with PE laminate bottle is Freezer friendly.Designed for use with cool liquids only.Not microwave of dishwasher safe. Hand wash only.Spray tops enable bottle use to help keep you cool, water your plants and many other applications.Bottles are lightweight and ship flat - great on your Wallet and the environment/carbon footprint.Features unique Global stock-art on front, clear panel back.Each bottle comes with reinforced grommet with carabiner for easy carry on the go.Carabiner is designed for use with empty bottle only. Use of carabiner with full bottle may result in tearing and other damage. CHOKING HAZARD-small parts. Not intended for children under the age of 3. For QCA request, products will come with the PO number. HydroPouch! 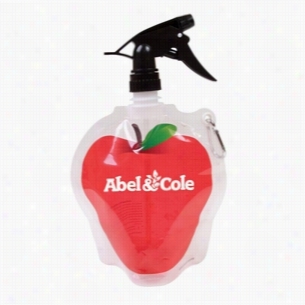 24 oz Apple Collapsible Spray Top Water Bottle - Patented. Exclusive, patented 24 oz reusable BPA-Free apple-shaped water bottle with polypropylene plastic spray top.Bottles are made of light-weight easy-to-fold, bendable plastic that means bottle can be collapsed flat and easily stored away when empty and stands like any other bottle when full.Bottles are made of durable Nylon with PE laminate bottle is freezer friendly.Designed for use with cool liquids only.Not Microwave of dishwasher safe. Hand wash only.Spray tops enable bottle use to help keep you cool, water your plants and many other applications.Bottles are lightweight and ship flat - great on your Wallet and the environment/carbon footprint.Features unique apple stock-art on front, clear panel back.Each bottle comes with reinforced grommet with carabiner for easy carry on the go.Carabiner is designed for use with empty bottle only. Use of carabiner with full bottle may result in tearing and other damage. CHOKING HAZARD-small parts. Not intended for children under the age of 3. For QCA request, products will come with the PO number.